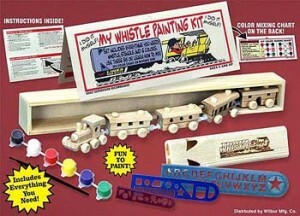 My Wooden Whistle & Wooden-Train Painting Kit | Brooklyn Peddler | Fine railroad novelty items and other fun things including the best wooden train whistle made! Create a one of a kind train and whistle. Includes a color mixing charge on the header back. Stencils for added creativity. Interactive, educational & delightful way to spend an afternoon. Train (all 5 cars) also sold separately!